Dark Fantasy, Urban Fantasy, or Paranormal Romance: Does a label matter? Lately, I've seen a lot of great discussions comparing the labels Dark Fantasy, Urban Fantasy, and Paranormal Romance: How are these labels defined by readers and writers, and how much of a difference do they really make? Paranormal refers to that which is outside of the normal physical experience: This could include special powers, magic, or other-worldly beings (such as aliens, werewolves, and my personal favorite, vampires!). Fantasy refers to the "other" world, itself: a physical setting that contains a different set of rules and realities. It may be under the sea, on another planet, or just plain one in which up is down and down is up (or the local bartender is a shape-shifter who puts magic dust in the drinks). Hmm, is he cute? Romance is more cut and dry: The story is basically boy meets girl; boy and girl fall in love (overcoming internal and/or external obstacles); and ultimately, boy & girl live happily ever after. In a romance, the relationship between the "boy and girl" must be the primary plot, and no other element should overshadow this. Oh, and you can probably expect to find S-E-X, unless it's a Y/A (Young Adult). Last but not least, Urban refers to a physical, urban setting: The world in which the story takes place is a traditional, urban world. The main plot involving the werewolf, faery, or shapeshifter will not take place under the ocean or on Mars (as it might in Sci Fi); rather, it will take place in a city or other urban setting. As an author, choosing a genre to write within helps define the boundaries of the story. If I want to create only human characters, I will avoid paranormal. If I want to stay within the expected (and largely agreed upon) boundaries of human behavior, mores, and traditions, I will avoid Fantasy, but if I want to push the limits (or simply change them altogether), I will indulge in the latter. To that end, it's worth having at least a basic understanding of the differences...especially if you have a strong or even singular preference toward one specific genre over another. As for myself, I tend to write what I love to read: Dark Fantasy, Urban Fantasy, and Paranormal Vampire Fictionwith strong romantic, suspense, & thriller elements! 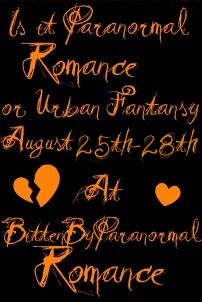 (Yes, I will read paranormal romance, too, as long as it contains many of the above elements). I like that breakdown, it makes sense to me. But...I find book blurbs are sometimes misleading and it's not the genre or subgenre that it led me to believe. If I see a book that looks intriguing, I may not buy it right away but research it first.